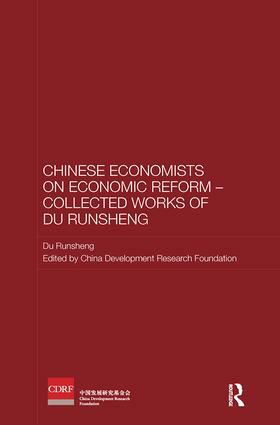 This book is part of a series which makes available to English-speaking audiences the work of the individual Chinese economists who were the architects of China’s economic reform. The series provides an inside view of China’s economic reform, revealing the thinking of the reformers themselves, unlike many other books on China’s economic reform which are written by outside observers. Du Runsheng (1913-) has made major contributions to policy making on land reform, rural development and science policy. Politically active from the 1930s, when he served as a guerrilla leader fighting Japanese aggression, and in the 1940s, when he was involved in the War of Liberation (1945-49), he has held many Chinese Communist Party posts. He was secretary-general of the Chinese Academy of Sciences in the late 1950s, responsible for drafting the 1961 policy document which urged respect for intellectuals. Attacked and persecuted during the Cultural Revolution (1966-76), he was for most of the 1980s in charge of research on rural economic reform and rural development strategies. The book is published in association with China Development Research Foundation, one of the leading economic and social think tanks in China, where many of the theoretical foundations and policy details of economic reform were formulated.